The sky is an expansive and wondrous thing. Humans have gazed upwards for centuries, trying to chart, index, record, and understand its vastness and what lies beyond. It can represent hope, knowledge, and the heavens, as well as loss and sadness. 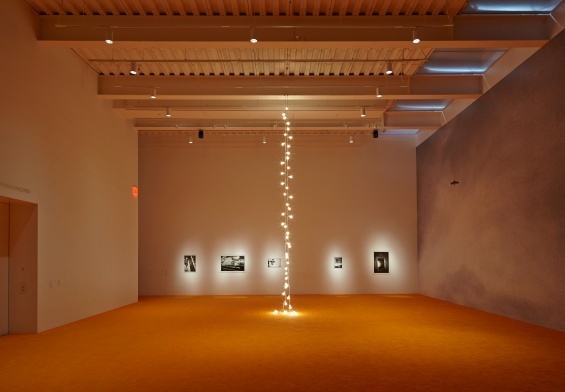 Discover how artists in “NYC 1993: Experimental Jet Set, Trash and No Star,” such as Felix Gonzalez-Torres, Robert Gober, and Lily van der Stokker depict the sky in their work. Then head up to the New Museum Sky Room and explore a few ways of studying the sky through several different projects. New Museum First Saturdays for Families are free of charge. This program is designed and recommended for families with children aged between four and fifteen years, and includes free New Museum admission for up to two adults per family. Children under eighteen are always admitted free. No preregistration is required. Space is limited and tickets are given out on a first-come, first-served basis. Your entire party must be present; tickets will not be given to partial parties. Support for the exhibition is provided by the Horace W. Goldsmith Foundation. Additional funding is provided by Martin and Rebecca Eisenberg, the Fundación Almine y Bernard Ruiz-Picasso para el Arte, and the Robert Mapplethorpe Photography Fund. The accompanying exhibition publication is made possible by the J. McSweeney and G. Mills Publications Fund at the New Museum.